Ford has delivered the European public debuts of the more powerful new Ford Mustang sports car; more capable EcoSport sports utility vehicle (SUV); and more premium Tourneo Custom people mover at the 2017 Frankfurt Motor Show, in Germany. The new Mustang, EcoSport and Tourneo Custom are joined by a new Ranger Black Edition pickup – limited to just 2,500 examples – also on display for the first time. Ford is showcasing the diversity of the company’s European model range in Frankfurt, from the all-new version of the Ford Fiesta – around 18 million of which have been built worldwide across four decades, to the exclusive Ford GT – limited to just 1,000 vehicles across four years of confirmed production and on show in recently introduced ’67 Heritage edition specification. “The breadth of our product range allows Ford to democratise innovations and sophisticated technologies – delivering them to customers of every type of vehicle. Our research into controls and displays for the Ford GT ultra-high-performance supercar has influenced the 12-inch digital display in our new Ford Mustang, and the ergonomic control layout of the new EcoSport,” said Steven Armstrong, group vice president and president, Europe, Middle East & Africa, Ford Motor Company. Germany is an important research, design and manufacturing centre for Ford. The foundation stone for the company’s manufacturing facility in Cologne, Germany – where the all-new Fiesta is built today – was laid in 1930. Cologne is also home to Ford Design and Product Development centres. Ford’s manufacturing facility in Saarlouis, Germany – where the Focus, C-MAX and Grand C‑MAX models are assembled – last year produced its 14 millionth vehicle. The company’s only Research and Advanced Engineering centre outside of the U.S. is based in Aachen, Germany. 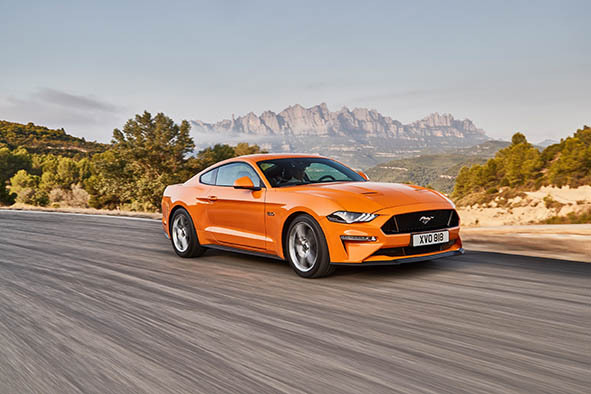 Sleeker, faster and more technologically-advanced, the new Ford Mustang for Europe delivers athletic styling, sophisticated engine and suspension upgrades and advanced driver assistance features. Ford has sold almost 30,000 Mustangs in Europe since the iconic sports car first went on sale across the region for the first time in more than 50 years, in early 2015. The instantly-recognisable, powerful Mustang profile now features a lower bonnet profile and more aggressive face. Dramatic rear-end design is enhanced with a re-modelled bumper and diffuser element. Mustang’s exhilarating performance and a fun-to-drive experience are enhanced with a further-developed Ford 5.0-litre V8 engine, delivering an anticipated 450 PS. Both the 5.0-litre V8 and 290 PS 2.3-litre EcoBoost are available with an advanced new 10-speed automatic transmission that uses real-time adaptive shift-scheduling to offer improved fuel efficiency* and acceleration. A new optional MagneRide Damping System can deliver a lightning-quick response to changing road conditions, and two new selectable Drive Modes – Drag Strip Mode and customisable My Mode – join the Normal, Sport, Track and Snow/Wet Modes. Active Valve Performance Exhaust technology includes an innovative Good Neighbour Mode, which can automatically limit the exhaust’s noise output to avoid disturbing neighbours. With Drag Strip mode enabled, Ford expects the new Mustang 5.0-litre V8 to be the fastest accelerating ever, with anticipated 0‑60 mph (0‑97 km/h) acceleration in less than 4 seconds, a time that was once the preserve of the most exotic supercars. New Mustang driver assistance technologies include Pre-Collision Assist with Pedestrian Detection, Adaptive Cruise Control, Distance Alert, Lane Departure Warning and Lane Keeping Aid. Also available is a customisable, all-digital, 12-inch LCD instrument cluster, while Ford’s SYNC 3 communications and entertainment system – compatible with Apple CarPlay and Android Auto™ – can be controlled by natural voice commands and using pinch and swipe gestures on the central 8-inch touch screen. The new Ford EcoSport compact SUV delivers enhanced versatility and capability, more refined styling and sophisticated technologies. Ford has sold 150,000 EcoSports in Europe since the model was introduced to the region in 2014. Ford Intelligent All Wheel Drive (AWD) is now offered for the first time, for improved traction on- and off-road, combined with an advanced new 1.5-litre EcoBlue diesel engine, delivering up to 125 PS and optimised CO2 emissions. Ford’s multi-award-winning 1.0-litre EcoBoost petrol engine also will be offered with three power outputs up to 140 PS. Dynamic, rugged and refined new EcoSport exterior styling reflecting that of the mid-sized Kuga and large Edge SUVs is offered in 12 bold colours. More personalisation options include contrasting painted roof colours that extend to the window pillars, upper door frames, rear roof spoiler and door mirrors. A user-centric, upscale new EcoSport interior features easier to use controls and soft-touch materials, with floating central touchscreens up to 8-inches. The new EcoSport line-up will also for the first time include the new EcoSport ST-Line variant, delivering unique Ford Performance-inspired exterior and interior styling. Sophisticated new EcoSport driver assistance technologies and convenience features include for the first time Cruise Control with Adjustable Speed Limiter and a rear view camera. Automatic headlights and rain-sensing wipers also are available, as are Ford’s Blind Spot Information System (BLIS) that can alert the driver to vehicles approaching alongside; a new 4.2-inch digital instrument cluster; power-folding, heated door mirrors; SYNC 3 connectivity; and a new premium B&O PLAY sound system specifically calibrated for EcoSport. The new Tourneo Custom people mover delivers first class travel for up to nine occupants. Featuring bold new front-end exterior design that shares the same design DNA as Ford’s latest passenger cars, the new Tourneo Custom is the only vehicle in its segment to offer six individual rear passenger seats with the ability to arrange the two rear rows in conference format for outstanding access and enhanced interaction between passengers, or in two rows of three seats facing forward. Rear seat passengers also benefit from more effective air conditioning system, six USB ports, and the 10-speaker audio system. Material quality is enhanced with thick yarn fabrics and fine grain leathers. Drivers will appreciate improved connectivity with Ford’s SYNC 3 system supported by an 8-inch touchscreen. The new Tourneo Custom is the first vehicle in its segment to offer Intelligent Speed Limiter. The new model also offers BLIS with Cross Traffic Alert. These new features add to the comprehensive suite of technologies already available for Tourneo Custom, including Pre‑Collision Assist with Pedestrian Detection, Lane Keeping Alert, Side Wind Stabilisation and Adaptive Cruise Control. Ford’s state-of-the-art 2.0-litre Ford EcoBlue diesel engine delivers up to 170 PS alongside significant cost of ownership and performance benefits. A six-speed SelectShift automatic transmission is smooth and responsive, and a unique-to-segment rear air suspension system delivers a supple, controlled and level ride across a wide range of load conditions. An upscale Titanium X package – including leather trim, SYNC 3 with satellite navigation and rear view camera, and HID Xenon headlamps as standard; and a dynamic Sport series – delivering 170 PS engine option, a full exterior body kit with twin bonnet stripes and unique 17-inch alloy wheels, and partial leather interior trim, also are offered. Limited to just 2,500 examples, the new Ranger Black Edition is a distinctive new version of Europe’s No.1 selling pickup, with a striking colour-coded appearance. The Black Edition model is based on the popular Limited series, and features a de-chromed body in Absolute Black with a black finish for the radiator grille, alloy wheels, sports bar and exterior detailing. Offered in Double Cab bodystyle only, the Ranger Black Edition standard equipment specification includes satellite navigation, front parking sensors and rear view camera, adding to the Limited series features such as Ford SYNC 3 multimedia system with 8-inch touchscreen, dual-zone electronic climate control, leather seat trim, and power-folding, heated door mirrors.